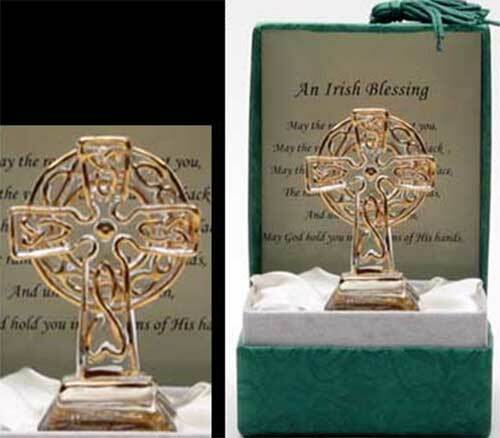 This Irish charm is a glass standing Celtic cross that is accented with knot-work and gold trim. The Celtic cross charm measures 1 1/2” wide x 2” tall and features an Irish blessing printed on the inside of the box lid. The Irish charm is gift boxed with Celtic knot and Celtic cross history cards, complements of The Irish Gift House. This clear glass shamrock charm features an Irish blessing. This clear glass clover charm features a blessing.